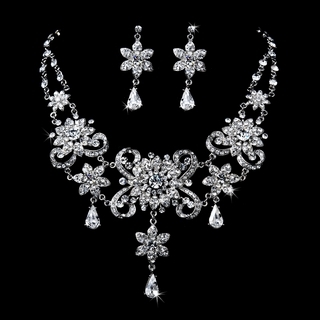 Silver-plated flowers weave throughout sparkling rhinestones in this stunning bridal jewelry set. The elegant floral design is sure to coordinate beautifully with your spring or summer wedding! Size: The necklace measures 16-1/2" long with a 4" extension. The central drop measures 3" tall. The matching earrings measure 1-3/4" in length.